My ears began to hurt, but I didn’t want to be seen covering my ears. That would be so uncool! And I can survive this. I survived the 17 minutes of noise that My Bloody Valentine uses as a senses-shattering climax to their live show. That tsunami of noise could split eardrums of leather. When I saw them, vibrations from the guitars knocked loose a plug from its socket, causing Kevin Shields’ guitar to go mute for several minutes. Last night’s performance at Bortolami Gallery was nowhere near that kind of volume, but it was equally difficult, and did embrace feedback as a fundamental tool. The gallery had described this as “a music performance.” When I saw guitars, drumsticks, and a mixing board, I was ready to rock! I was already thrilled to be surrounded by Rich Aldrich’s painting show, his first in Bortolami’s colossal cavern. The paintings are assiduously intellectual and adventurously unconventional, subjugating brush gestures as just another technique, no better than cutting the canvas, gluing clothes and postcards to it, scratching in figural images, or leaving white space untouched. And the pair of portraits, Looking and Looking with Mirror Apparatus are rumored to depict John Cale. I was ready to avant-rock! 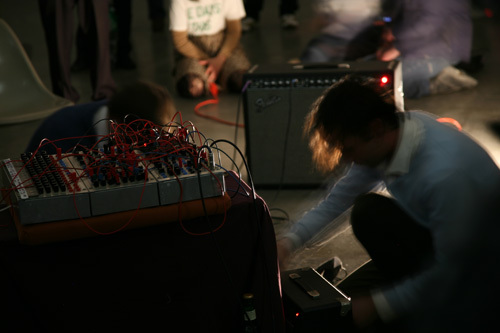 Rich and experimental composer Stefan Tcherepnin played their instruments in almost every other way possible. That is, they shook, struck, stepped on, bumped, and slapped the guitars; but they did not strum the strings. 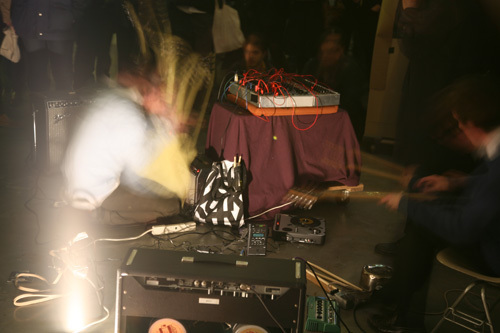 Rich shook and waved his guitar around the feedback field, modulating the squeal, which made his instrument more like a theremin. Stefan banged his guitar against the amplifier, allowing the knobs to pluck the strings. Between the effects pedal, the microphones, the guitars, and the amplifiers, most of the music had already been generated before the artists lifted a finger. Jeff Perkins, an artist whose light shows have illuminated the music of the Velvet Underground and Grateful Dead, and who pioneered Fluxus alongside Yoko Ono, Nam June Paik, and George Maciunas, conducted a fugue of color slides. 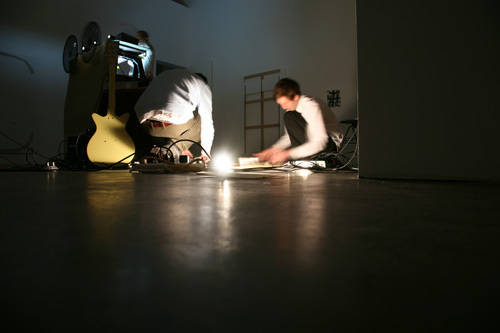 Four slide projectors atop a primitive platform -just a slab of wood on saw horses – beamed onto the wall numerous geometric, bright, monochrome arrangements of dots, crosses, hatch patterns, ovals and more. 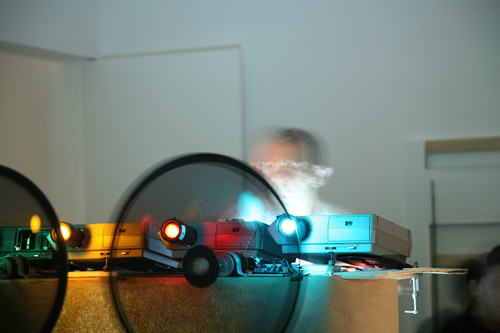 Motors positioned between the projectors on the platform powered two spinning discs, made of humble materials, maybe just plastic sheets taped together. 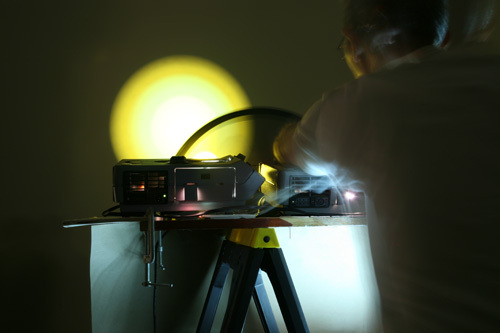 These spinning discs spun through the projectors’ beams, intermittently eclipsing the images, and chopping - the way jet engines do geese - the steady images into a flashing sequence. The music shifted when Rich laid down his guitar and reached for the drumsticks, repetitively dropping them against the floor, as if they were greased up and hard to grasp. Then he dropped the microphone into a metal pot, over and over, causing a percussive thud, until he picked up the pot and began to bang it on the concrete floor. Meanwhile, Stefan twiddled knobs, sculpting the distorted squeal, shriek, drone, and buzz that filled the air. The combination of unpleasing noise and rapidly flashing colors reminded me of the video installation, Epileptic Seizure Comparison (1976) by Paul Sharits, which exhibited last year at Greene Naftali. One motive of that piece was to simulate the sensation of an epileptic seizure, while the viewer simultaneously watches footage of seizure patients. Likewise, the combination of the projections and noise generated a feeling of disassociation that bordered on hypnotic.